Who knew that making cheese could be so fun or so easy? I took a class on homemade Mexican food a while back, and this recipe was the simplest thing we made. So, when chatter about a Global Supper Club: Mexican Edition picked up, I knew this creamy goodness would make an appearance. It’s really cool to see milk separate and turn to cheese right before your eyes, triggered by nothing more than heat and lemon juice. It would be fun to make this recipe with a kid. Now, on to the cheese itself. 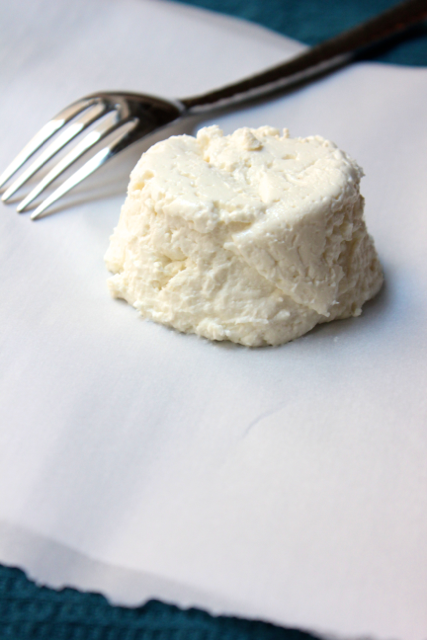 Queso fresco is a very simple, mild Mexican cheese that can be used in, or sprinkled on, a variety of dishes (think tacos, enchiladas, salads, etc.). And if you press queso fresco, you’ll end up with paneer (an Indian cheese that frequently stars in curries). 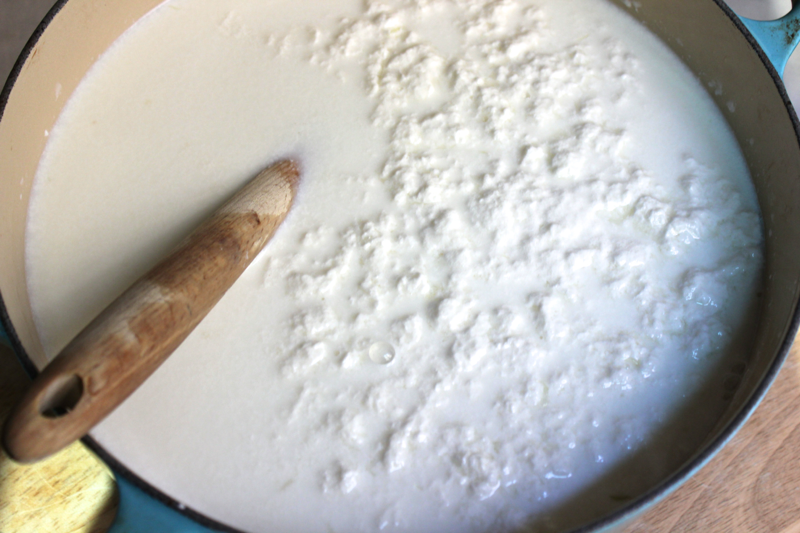 To make queso fresco, get a very large pot, and pour in 1 gallon of whole milk and 2 cups of buttermilk. As usual, I forgot to buy buttermilk, so I made a substitute with 2 cups of regular milk and a healthy splash of white vinegar. After about 5 minutes, the milk thickened up, and I added it to the pot. The substitution worked like a charm. Heat the milk, stirring frequently, until it steams. Then, squeeze in a generous amount of lemon or lime juice. Stir the milk in a circular direction to create a whirlpool. You should see the milk starting to separate and form curds. This process happens quickly and is finished when you have cheese curds floating in a clear, greenish liquid. 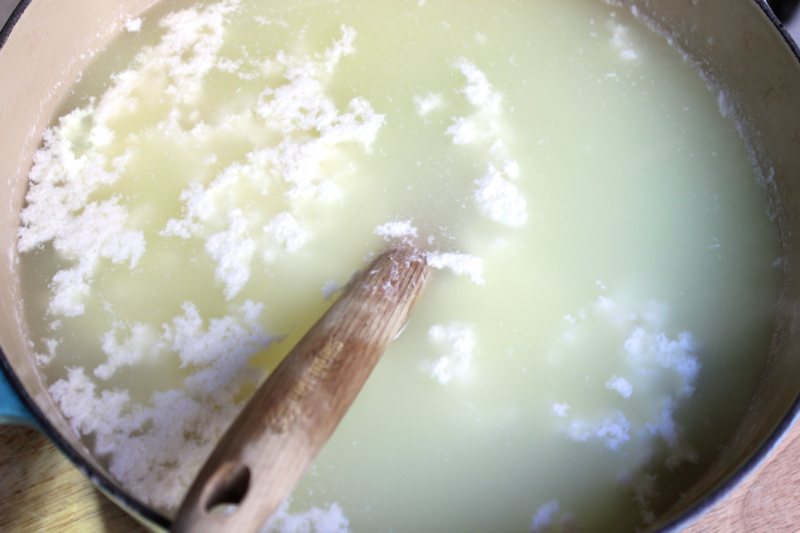 If your curds aren’t forming properly, you need more heat, more lemon juice, or both. 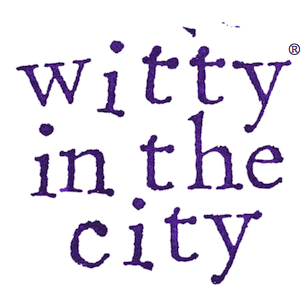 Play around with these two variables until you’re left with curds and whey. 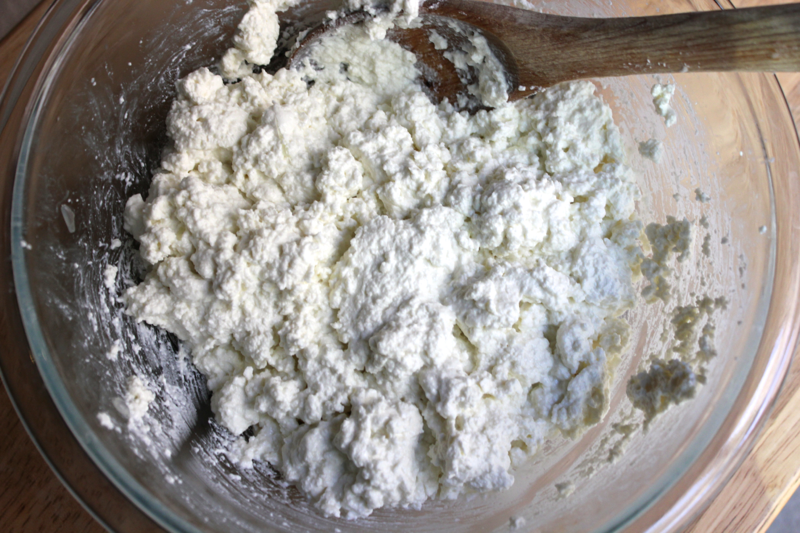 Seeing what curds and whey really look like makes me wonder what the hell Little Miss Muffet was thinking. It’s time to strain out the cheese curds. Line a strainer with cheese cloth, and pour everything from the pot through. Obviously, I didn’t have enough foresight to buy cheese cloth, but my fine mesh strainer was an acceptable substitute. Gather up the edges of the cheese cloth, and squeeze out as much liquid from the cheese as you can. 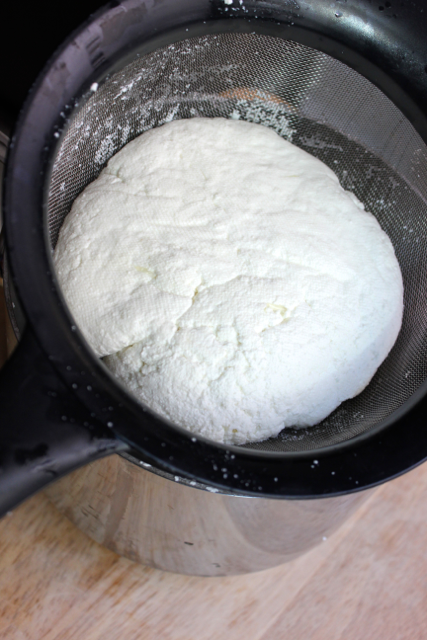 Transfer the cheese curds to a bowl, and season them to taste with salt. Try to avoid over-mixing them. If you did, I think you’d eventually end up with mozzarella, but I am still working to confirm that potentially-delicious hypothesis. Lightly press the cheese curds into a shaping device. Metal rings work well, as does a muffin tin. 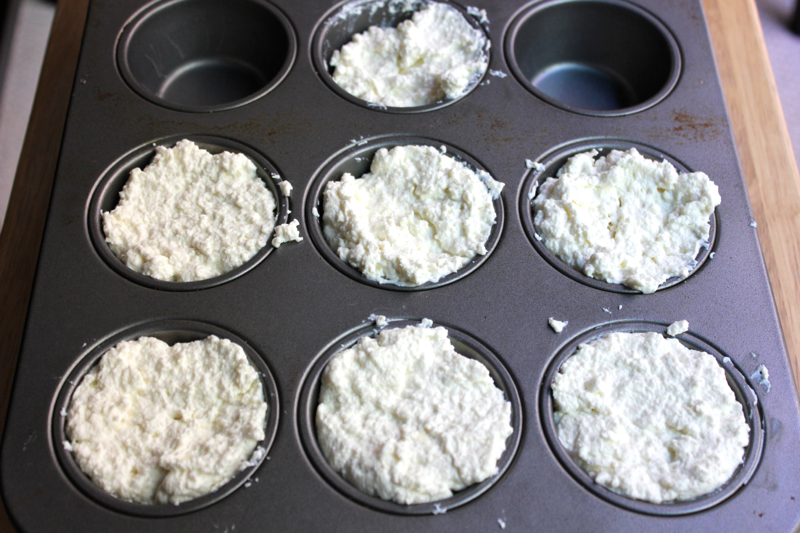 Refrigerate the cheese so that it cools and sets, then pop it out to eat! The cheese can be spread or crumbled on anything you choose! Has anyone else had fun making cheese before, or know the answer to my mozzarella query? I’ll tell you about the fiesta that was the Global Supper Club: Mexican Edition next time. You actually need rennet to set mozzarella cheese. What you’ve made here is essentially ricotta. 🙂 I make it all the time and it’s delicious.